I have always lived by one motto when it comes to Italian food . 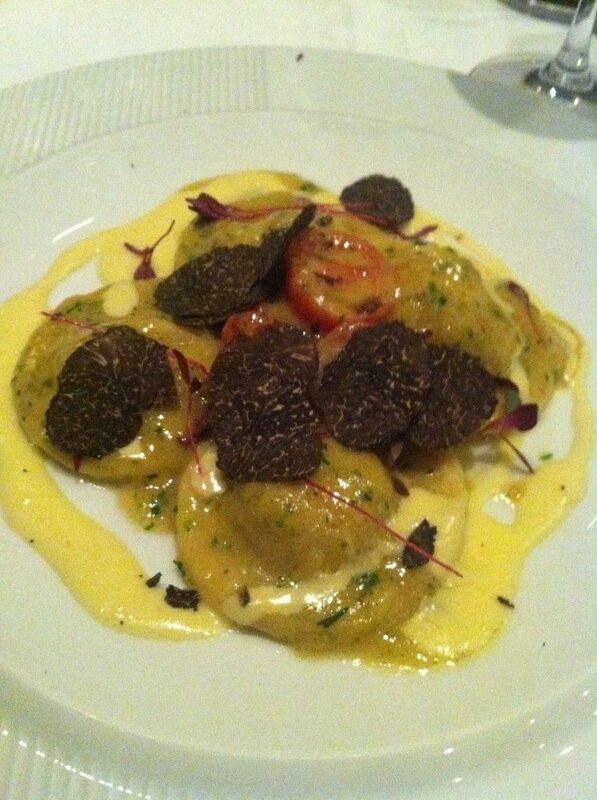 . . one can never have enough truffle; so in vain of this mantra Charlotte and I put it to the test at Four Seasons London at Canary Wharf in their on-site Italian Restaurant Quadrato. e walked into the sleek and elegant restaurant situated in the Four Seasons hotel in Canary Wharf which is decorated in dark woods and warm colours, spilling out on to an attractive riverside terrace (where al fresco dining can be enjoyed during warmer days) to be greeted by the attentive and pleasant staff. We were shown to our table which was beautifully laid out for the two of us to dine and we were shown the selection of menus and the range that Quadrato has to provide for food and wine. An exhibition kitchen provides a glimpse in to the preparation of the fresh, delicious northern Italian food which makes up the Quadrato menu. We decided on the special Quadrato at Four Seasons menu ‘The Black Truffle’ and looked at what we would be eating over a glass of Rose Champagne selected by our server and a selection of breads with oils to dip, a pleasant start to our visit. 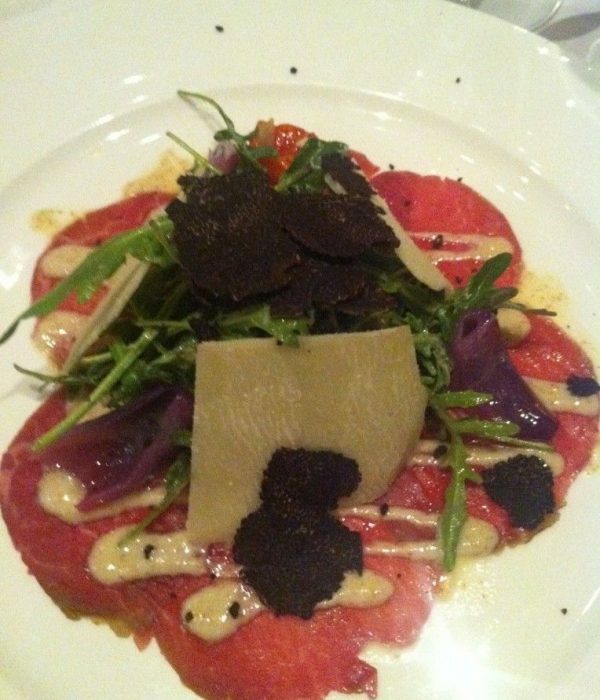 The first course was Beef Carpaccio which was perfectly dressed in a sauce with flavours of garlic and mustard and perfectly seasoned rocket salad, you could also have this with chestnut mushroom which gave a earthy feel to the dish. 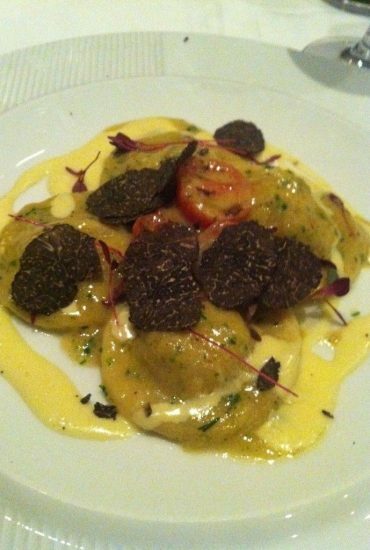 The Truffle is brought to your table by chef and shaved over your food in front of your eyes, the addition of the black truffle gave a new twist on this Italian classic starter. 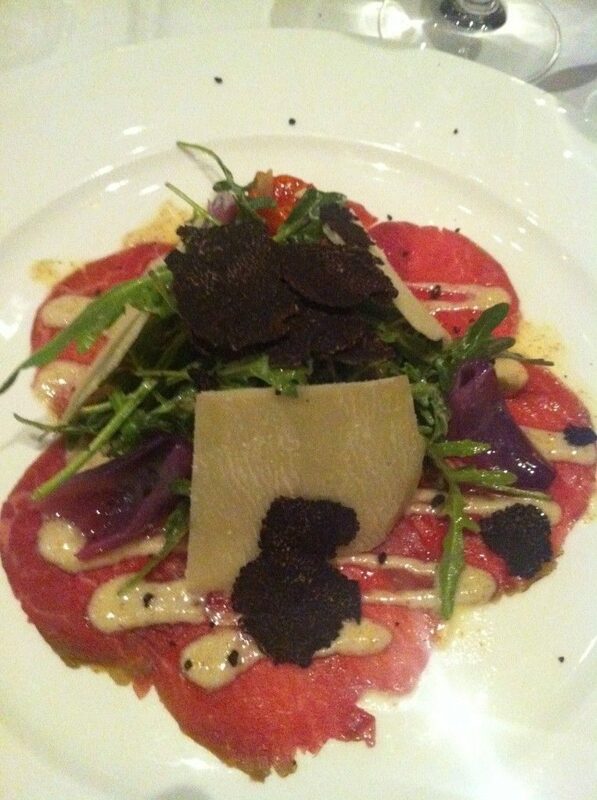 The wine choices for this dish made by Valeria our sommelier for the evening were a Chardonnay – Cantina Terlano 2009 from Italy and a Marques De Murrieta Reserva from 2005, both equally complimented the carpaccio. Next up was the wild boar ravioli which was meaty, earthy and a wonderful interlude between courses. The sweet sauce with leeks contrasted the boars meatiness, the dish smelled beautiful and was a mixture of delicate tastes on the palate with a parmesan fondue. For the main event I went for the duck which was served with a sauce that had flavours that worked really well with the addition of truffles, the sauce was based around sweet plums and onions and the duck was beautifully cooked to my liking of medium-rare. he wine choice for this pairing was a white Cortese Giustiniana from Italy for my dish, this worked well, a fresh and crisp wine from 2010. Charlotte went for the beef which once again was cooked to perfection and the sauce was rich and accompanied with sweet onions and smoked aubergine in cased in a red pepper, creamy and smoky and I was informed by my co-diner it was like finding Pandora’s Box! The pepper and onion worked well with the meat and the truffle shavings once again a great addition to an otherwise classic dish. The wine choice for this paring was a Chianti Classico from Tuscany Italy, a quintessentially Italian wine that complimented the beef perfectly. 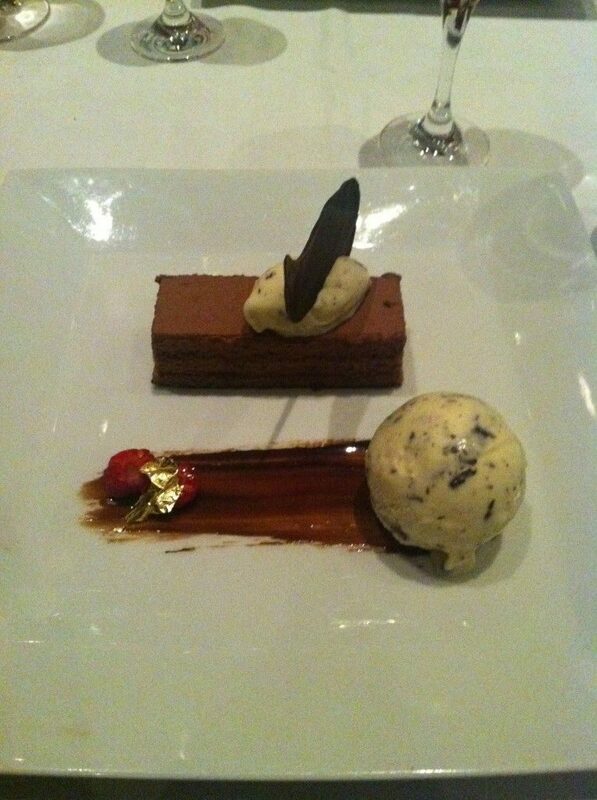 Dessert was the truffle special of dark chocolate mousse which had the hints of truffle smell (not too overpowering) and the chocolate was light and the true Italian classic of Strachatelli ice cream was a perfect match with the addition of a red fruit coulis. 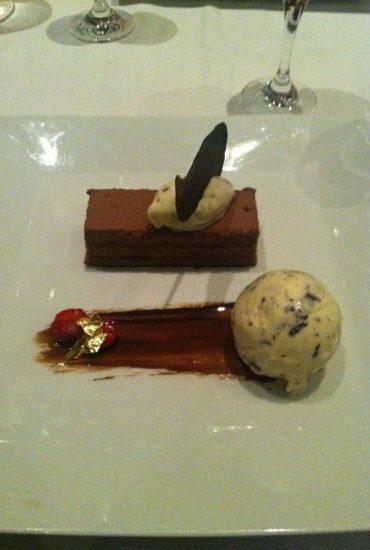 The savoury bitter taste of the truffle and chocolate complemented the ice cream. Valeria, our sommelier, gave us some interesting wine pairings starting with Port – Pinto Vintage from 1997 which worked well with the chocolate tastes, the colour was a dark rouge and smelled divine. We were also given a Tokaji from Hungary 2004, this also worked well with the dessert and it would be hard to choose which dessert drink worked better with the tastes of the mousse, I would quite happily drink both! After dining I recommend relaxing in the stunning Quadrato bar, like we did, where dramatic views can be enjoyed through huge floor to ceiling windows, I can highly recommend the Tiramisu Martini, it is to die for! 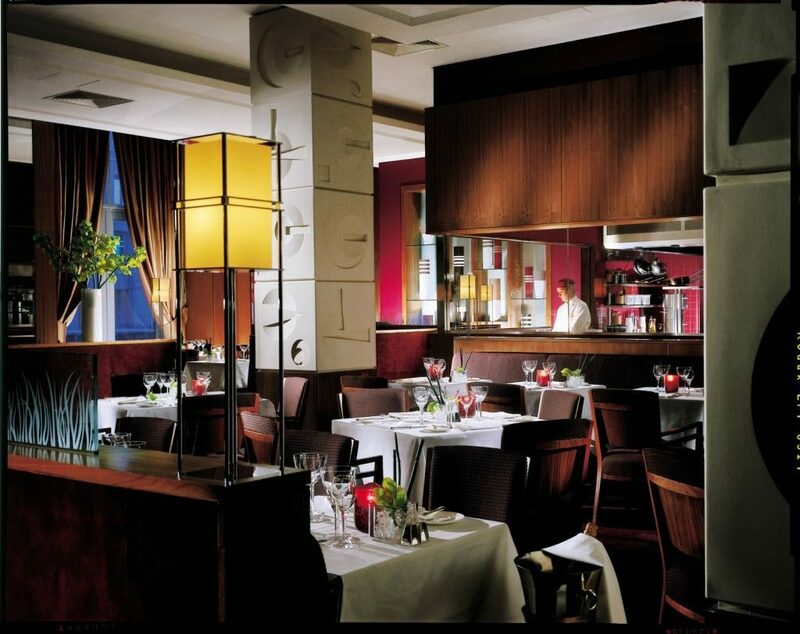 The food, service and atmosphere were all ten out of ten and we will definitely be returning sometime soon, Quadrato makes for a wonderful welcoming place to have lunch or dinner when either staying at the hotel or visiting the Canary Wharf or Greenwich.